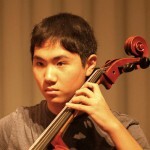 Congratulations to Samuel Lee, winner of the 2011 String Academy of Wisconsin Cello Competition. Samuel will be featured on the Spring Play-In Concert on April 16, playing the Vivaldi’s Cello Concerto in d minor, RV 406I. Thanks to Trischa Loebl for adjudicating and to Mary Anna Salo for accompanying.